Last week we shared some of our favorite Instagram photos that we felt so perfectly captured the contagious energy and vibrance of the city. If you happened to read the post, then you might remember that we said this week we’d be talking more about what it was actually like to live in a pacified favela. Unfortunately when we sat down to put the post together, we realized our photos of Vidigal are on our external hard drive—in Costa Rica. And we are currently visiting with family and friends in North Carolina. Since we simply cannot talk about Vidigal without our favorite photos of the favela, it will be another two weeks or so before we can share that story with you. So that’s the backstory :) But in the meantime, we decided to dive into one of our absolute favorite aspects of living in Rio de Janeiro—the great (and gorgeous) outdoors! Rio de Janeiro is one of the most uniquely beautiful urban landscapes in the world. ‘La Cidade Maravillosa’ is fringed by golden sand beaches, verdant mountains, and dense tropical jungle. That means that no matter where you are in the city, you’ll find an array of outdoor activities and adventures easily accessible. We love nothing more than spending time outdoors, but we also love the energy of city living. Typically it’s a difficult balance for us, but in Rio de Janeiro, the city and stunning natural beauty go hand-in-hand. 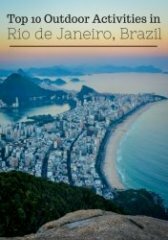 If you’re anything like us, then we know you will love Rio too—we hope this guide to our top 10 favorite outdoor activities in and around the city will help! Rio de Janeiro is considered to be one of the world’s best locations for outdoor urban climbing. It’s not necessarily the best place for absolute beginners, but if you have a little bit of climbing experience, then you’ll be spoilt with choices (especially around the Urca area). If you’re up for the climb of a lifetime, then don’t miss the chance to scale Sugarloaf Mountain. We admittedly took the gondola to the top, but if we ever return to Rio, we would love to give this climb a go. We’ve visited a lot of botanical gardens on our travels, and while we typically enjoy them, they aren’t necessarily anything to write home (or on the blog) about. But Rio’s picture-perfect Botanical Gardens are certainly an exception. The gardens feature manicured gardens, exotic plants, towering palms, serene ponds, and more. We recommend taking your time as you meander along the paved walkways and enjoy the scenic escape in the middle of the city. Don’t be surprised if along the way you spot toucans and monkeys, too! One of the best ways to actively explore all of Rio’s most beautiful attractions is via bicycle. The city now has some 250km of bike lanes, along with over 600 BikeRio city bikes available for rent. Our favorite place for a leisurely afternoon of biking was the Rodrigo de Freitas Lagoa. Here there is a 5km path surrounding the lagoon, with gorgeous views of Christ the Redeemer. It can get busy here with families and joggers on the weekend, so try to time your visit during the week. It’s a short but intense hike that will take you to the best view in all of Rio de Janeiro. Access to Dois Irmaos is found in the back of Vidigal. From the top of the mountain you’ll have absolutely amazing views over the areas around Leblon and Ipanema. We recommend timing your hike with the sunset or—if you’re bold and ambitious enough—the sunrise. Descending down the back of the mountain you’ll also have the opportunity to view Rocinha, the largest favela in Brazil. Rio de Janeiro might not have the same legendary surf reputation as destinations like Bali or Hawaii, but there are still plenty of places to catch a great wave. If you’re a beginner or intermediate surfer, then start at the Arpoador (the giant rock that sticks out into the ocean between Ipanema and Copacabana). Here you’ll find gentle but consistent waves, along with plenty of locals renting boards for the day. Even if you’re not a runner, you’ll be tempted to go for a jog down the boardwalk that lines Ipanema beach. Here you’ll have plenty of company from other locals and tourists also trying to get their daily exercise in. There’s also tons of people-watching opportunities and entertainment along the beach, including the chance to watch footvolley (a Portuguese game combing volleyball and soccer). Because when you’re in Rio, you have to go to Copacabana! This wasn’t our favorite beach, but spending an afternoon sunbathing on the iconic beach is an absolute must. We recommend grabbing a coconut or a caipirinha to enjoy while wondering how Brazilians pull off such itty bitty bathing suits. Another must-do while in Rio de Janeiro is visit Christ The Redeemer. Located atop Corcovado Mountain and surrounded by rainforest, a visit to the Redeemer is an outdoor adventure in and of itself. The easiest way to arrive is to take the 20-minute Corcovado Railway ride through Tijuca National Park to the summit. Alternatively we’ve heard there are ways to hike to the top, but we can’t speak from firsthand experience. Prainha is located south of downtown Rio in an environmentally protected area. While others battle for turf at Ipanema and Copacabana, you’ll get to enjoy the pristine white sand beach, perfectly turquoise water and lush surrounding mountains crowd free. The beach gets a few visitors on the weekends, so if you want the gorgeous white sand shore all to yourself try to visit during the week. Other than a handful of kiosks selling coconuts and renting out surfboards, you’ll have this slice of paradise all to yourself. Tijuca National Park is one of the largest urban forests in the world, containing hundreds of species of exotic plants and wildlife. It’s also here that you’ll find Rio’s highest mountain, Tijuca Peak. Hikers can enjoy two different lookouts on the trail leading up to the top. The first, Tijuca Mirim Peak, boasts unobstructed views of downtown Rio and the newly renovated Maracana Stadium. The main peak offers a 180 degree view of the coastline and its many mountains.